Joining with Lisa-Jo's group for Five Minute Friday - where we all write for five minutes - just five - on a given topic. No editing. Fun times! This week's topic is quiet. He had a hard time settling down today. I thought the fresh air from our zoo excursion would have worn him out. Up-down, up-down from my lap to the couch to the floor. This new found freedom of being able to climb with just a little assistance (and a lot of supervision) from mama. But finally I was able to scoop him up, and hold him just right. 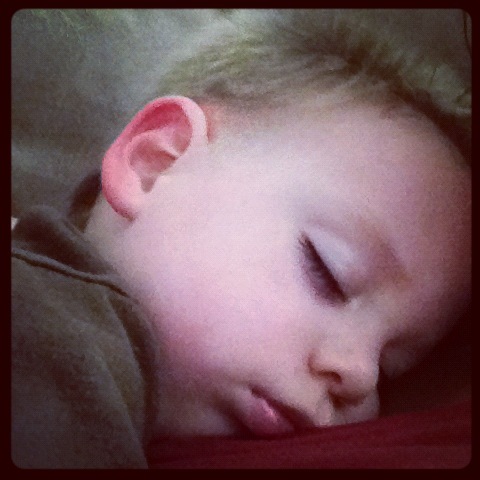 His body somehow nestled into my arm, his head with the crazy hair rested perfectly on my chest. And the sound of his breathing took over. He relaxed. He snuggled. He snored just lightly enough to be completely adorable. This sound, this quiet sound, only lasts a few years. Soon he will be bigger, and his noises will be more manly. But right now, at naptime, he is still my toddler, my still-quiet-enough-at-the-right-moment-baby. Something prompted me to get out my phone and record. Capture the quiet. Capture this moment that is fleeting. I'm not a mom yet, but I'm sure those quiet moments with a sleeping child nestled up on your lap are precious. Thanks for sharing! Oh I know how that feels, the deep desire to capture it and save it forever. Baby snores and snuggles are the best!! !